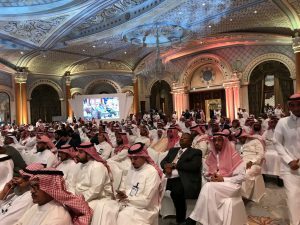 The Dates International Conference was held 11 and 12 April 2018 at The Ritz-Carlton Hotel in Riyadh, Saudi Arabia. The conference aimed to demonstrate major investment opportunities of this sector in presence of decision makers and businesspersons. It confirms the importance of Saudi Arabia as the most important country in producing dates. Several companies and institutions were represented at the exhibition room. GMBS was invited to introduce the Cold Chain Cluster, a brand new agro-food public private partnership. GMBS, Maarten Smit, shared his views on cooperation and value chain marketing. Presentation slides can be made available upon request. Cold Chain Cluster. 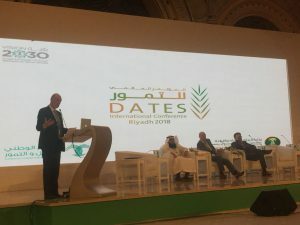 The cold chain cluster is a Dutch initiative to assist GCC countries in providing holistic cold chain solutions that facilitate efficient agro-logistic infrastructures and reduced food losses for perishables. Practically, the Cold Chain Cluster seeks to assist GCC eligible counterparts in the design, built and operations of fresh produce distribution centers, packing houses, auctions, wholesale markets and related infrastructure. It does so by providing quality products and services in close cooperation with its qualified host country counterparts. The cluster comprises of ten carefully selected member companies and is growing. More details can be found on www.coldchaincluster.com.